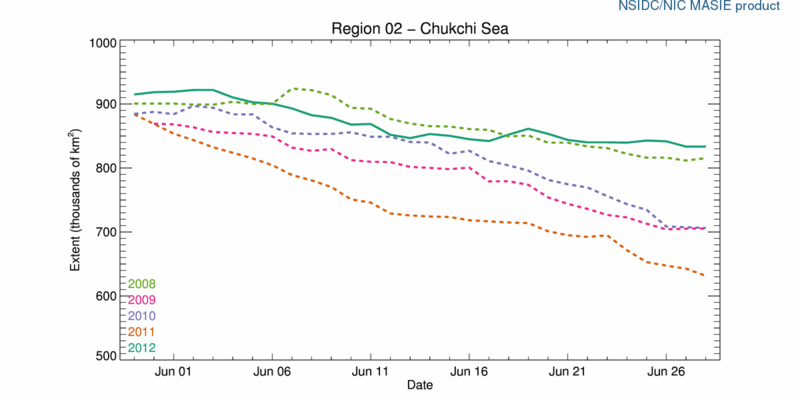 WUWT Sea Ice Page Upgrades and Northern Regional Sea Ice Overview | Watts Up With That? From the Naval Research Laboratory (NRL) – HYCOM Consortium for Data-Assimilative Ocean Modeling links to the Arctic Sea Ice Thickness 30 Day Animation at the head of this article and this 365 Day Animation, as well as a current Arctic Sea Ice Thickness Image. Terra 4km True Color Arctic Satellite Mosaic Image, Terra 4km Bands 3-6-7 Arctic Satellite Mosaic Image, and Aqua 4km True Color Arctic Satellite Mosaic Image all with single region zoom and image capture capabilities. “Why is their open water, NNE of Alaska and North of Canada, on the west side of all the islands that make the east part of the Northwest Passage interesting. Anyway, the new satellite images linked on WUWT’s sea ice page are helpful in researching and capturing regional Arctic sea ice events, as is our last addition. Please note that WUWT cannot vouch for the accuracy of the data within the Reference Pages, as WUWT is simply an aggregator. All of the data is linked from third party sources. If you have doubts about the accuracy of any of the graphs on the WUWT Reference Pages, or have any suggested additions or improvements to any of the WUWT Reference Pages, please let us know in comments below. 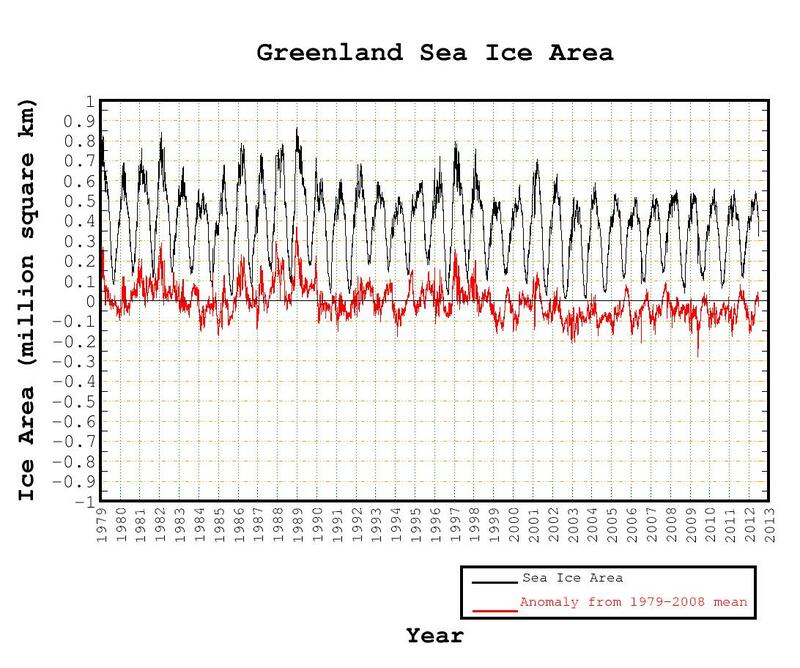 Record high sea ice doesn’t matter anywhere, since it’s only ‘natural variation’. 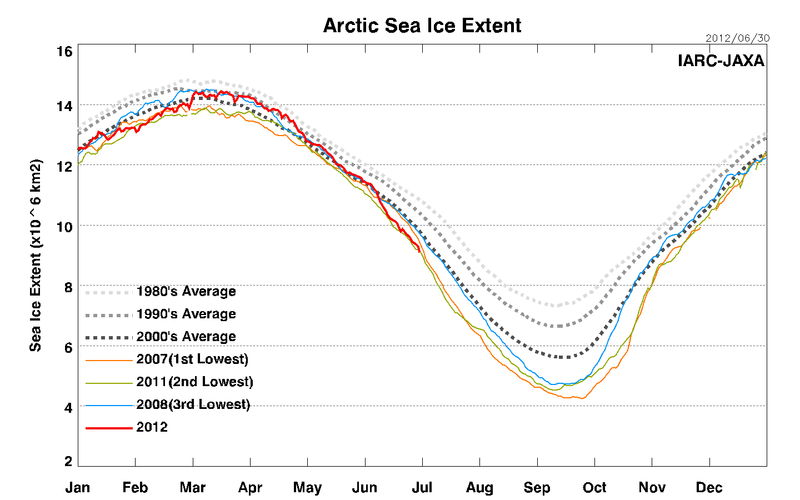 But when ice melts every spring, it’s the Arctic death spiral. WUWT can post all the data in the world but it won’t matter to the faith-based AGW crowd. They already have their US thermometer network rigged to constantly give ‘record highs’, so they can just keep braying about ‘melting icecaps’ and be believed. With the AGW debate we have learned an important lesson: in the fullness of time humanity is really full of it. 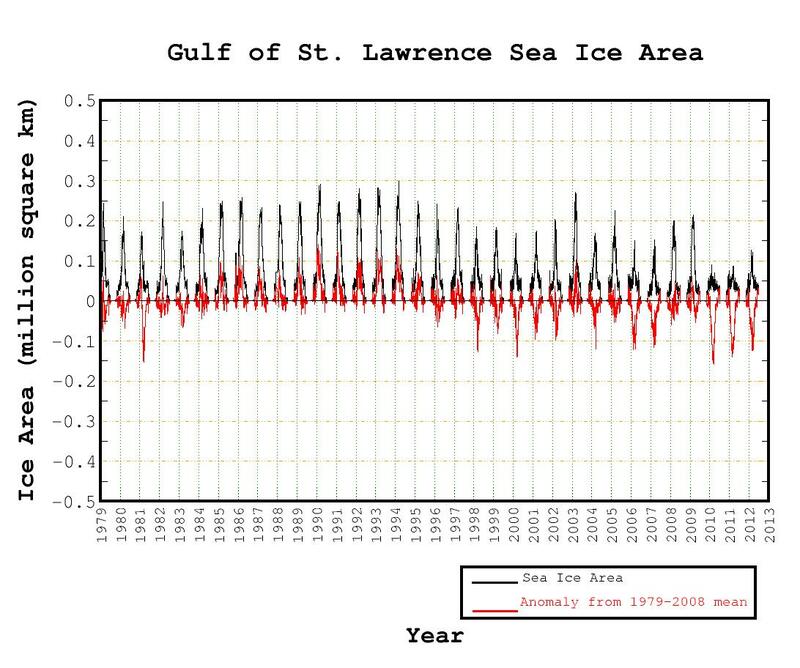 The AGW mob must hate the fact that the Antarctic refuses to play to their death spiral nonsense. I hope you will take this as constructive criticism. Sometimes charts and graphs on WUWT are not well labeled. In the case of the ice thickness chart the units are not indicated. Is the thickness in feet, meters, mm, inches or what? On the top of the post for the Naval Research…, the date counter goes to July 6, 2012 while the date counter just below goes to June 30th, 2012. Nice animation. And it brings up a question – since the Arctic Circle is not presented, what do we mean when we say “Arctic ice” for purposes of calculating extent? It looks like a hotspot, or undersea vent, just off the west edge of the Canadian archepelago — off Banks Island. Open water appears there early, freezes over late, and the top chart of this article shows what looks like warmed water etching into the ice there. Better tell Tamino, he has a history of not noticing pages like this. Oops, just now I see there is good coverage of precisely that topic (the open water off Banks Island) in the article text. Pardon me! Still, there could be an undersea vent there, in addition to what the article says. On the WUWT Sea Ice Page I’ve added “in Meters” to the title of the Sea Ice Thickness image, in order to help avoid confusion. If so inclined, you can contact the NRL/ACNFS Webmaster at acnfs_webmaster@nrlssc.navy.mil and ask if they can add the measurement units to their charts. “This site contains real-time nowcast/forecast results from the 1/12� Arctic Cap Nowcast/Forecast System (ACNFS), including snapshots and animations of ice thickness, ice concentration, ice speed and drift, sea surface height (SSH), sea surface temperature (SST) and sea surface salinity (SSS). ACNFS is a coupled sea ice and ocean model that nowcasts and forecasts conditions in all sea ice covered areas in the northern hemisphere (poleward of 40� N). 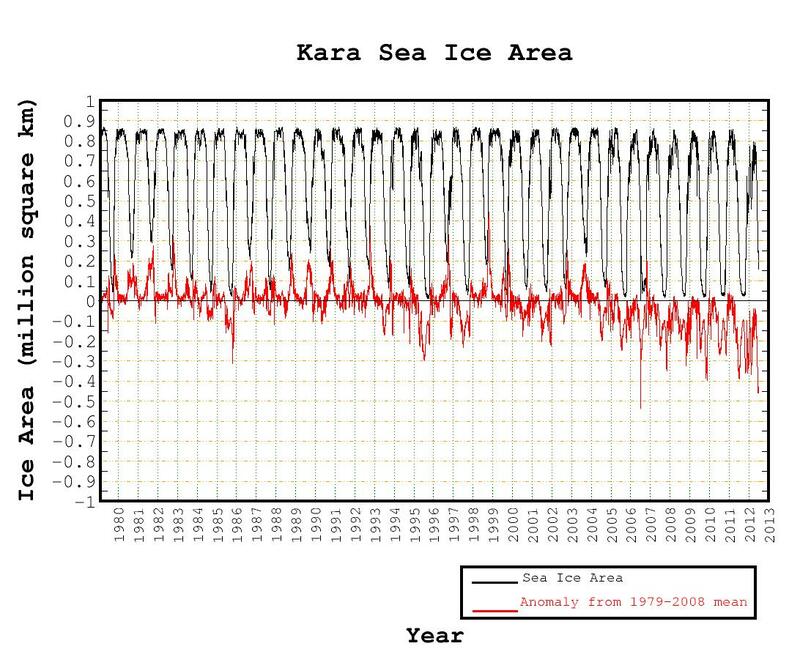 In ACNFS, Community Ice CodE (CICE) (Hunke and Lipscomb, 2008) is used as the ice model and is coupled with HYbrid Coordinate Ocean Model (HYCOM) (Metzger et al., 2008, 2010). Ice and ocean fields are passed between the two models hourly using Earth System Modeling Framework (ESMF) (Hill et al., 2004). The ice and ocean models are set up and coupled on the same 1/12° horizontal grid. Resolution is approximately 3.5 km near the North Pole and 6.5 km near 40°N. A plot of the grid resolution can be seen here. Atmospheric forcing in ACNFS is obtained from the Fleet Numerical Meteorology and Oceanography Center 3 hrly 0.5° Naval Operational Global Atmospheric Prediction System (NOGAPS) (Hogan et al., 1991) forcing. On the WUWT Sea Ice Page I’ve added “Real-Time Nowcast/Forecast” to the title of the Sea Ice Thickness image, in order to help avoid confusion. 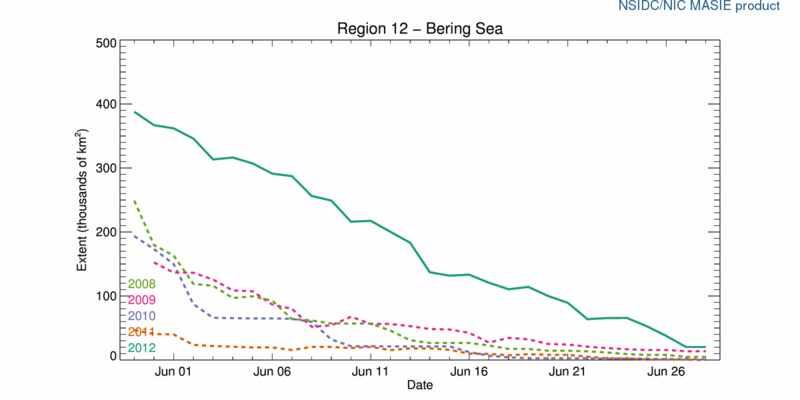 Appears to be melting from MacKenzie and from surface water entering through the Bering Strait. Facinating plastic flow from this point along the 2m contour directly over the pole and down the east coast of Greenland. Links to the terra sat images are dated links from 7/31/2011. Need to use these links for the most recent. Is this Wikipedia’s error or an error of transposition? This would amount to 300 trillion barrels. in 2009 the world produced 25 billion barrels. Just the facts … Well, one does require a balance between the mind and the heart. In a corrupt world ruled temporarily by the evil of our adversary, a knowing of truth from the heart in proper relationship with God is far more advanced in understanding from within, than any formal university education in the world, regardless of the subject matter. The spiritual potential of human beings is so much greater than any technology that exists, that the world is more advanced in technologies than it is spiritually. This speaks volumes of the nature of evil, that it hides our true nature and that of all life from us so well, that very very very few are spiritually prepared for our true reality…that which is pure spirit, and no longer energetic. That said, there is certainly very little in this life I wish to sustain at all. Physical life is but a shadowy whisp against limitless potential in eternity. Advanced physics are important to study even if like myself, it’s understood intuitively since in practice, we are not all advanced in our comprehension of physics…far from it. There are for example equations or concepts a contact of mine Dr. John Droz would have no trouble with due to his particular education, that are simply beyond my ability & have never been trained for. But when it comes to industrial scale wind energy, we are in complete agreement. I have been in the energy industry for over fifteen years now, but I am self educated about the topic of energy generation…especially on the true nature of the ultimate energetic source, the unified field and the earth itself, now weaponized and used against humanity. My good friend Dr. Mike Castle who discovered the welsbach seeding is another I am in complete agreement with, but he is a polymer chemist and environmentalist, who’s knowledge base is quite different than DR. John Droz., so it takes in all kinds of studies to unravel the truth. Both these gentlemen have done great work to bring truth to light. There is geoenergetics for non living systems bioenergetics for living systems, and psycoenergetics for mind and emotion. It is this knowledge that has weaponized earth to increase the severity of these long term cyclical celestial events in order to gain control. I spent ten years in the military. When I read the prerequisits for career training in military intelligence, I said to the fella next to me, well, I don’t know why this trade was offered to me… but I sure would like to meet the fella they’re talking about in this description ! Today however I have basic understanding of things I could never explain or prove using math skills. That Arctic Satellite Imagery is really nice. Great detail. You can even see the drowning polar bears . . . 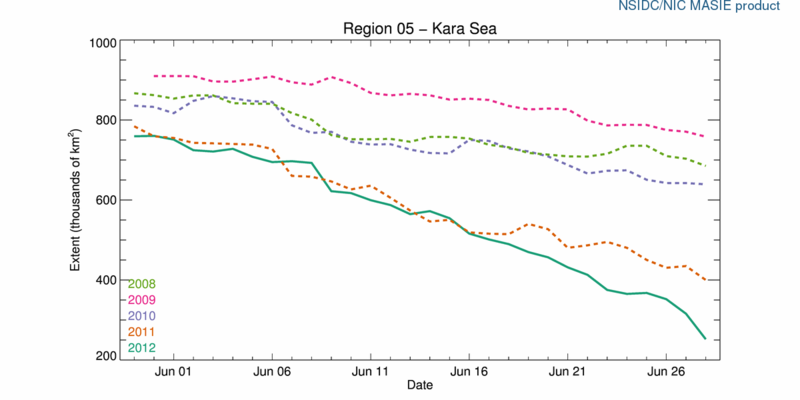 Many of these charts seem to coincide with oceanic and atmospheric trends. And they all look roughly like sine waves. 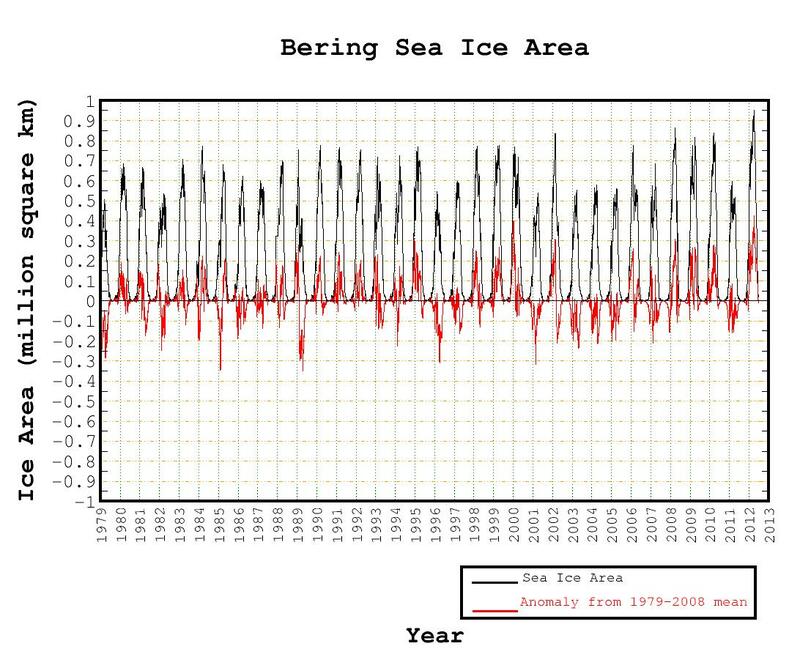 Because the data begins in ’79 or whenever the individual satellites started sending data back to us, does not mean the trend seen is a linear trend. With the side-blindered view we have of satellite data, no wonder the easily convinced hot-to-be-top scientists jump on this data as proof of their latest biblical pronouncement that the world will end lest we board a spaceship. The majority of ice melt is due to volcanic activity. Without meaning to sound negitive to bliblical proportions…the coming ice age is part of what has been foretold. Is there any significance in the growing difference between the annual maximum and minimum over the last three decades? If so, would that suggest increasing heat transfer from the Arctic ocean through the atmosphere- or just altered sea ice aggregation? What is significant is the amout of sulphur dioxide and rain fall from increased volcanism. These are some of the signs of the ice age returning….far from being global warming due to co2 levels rising which to believe is simply ignorance. Your conclusion is correct (IMO). 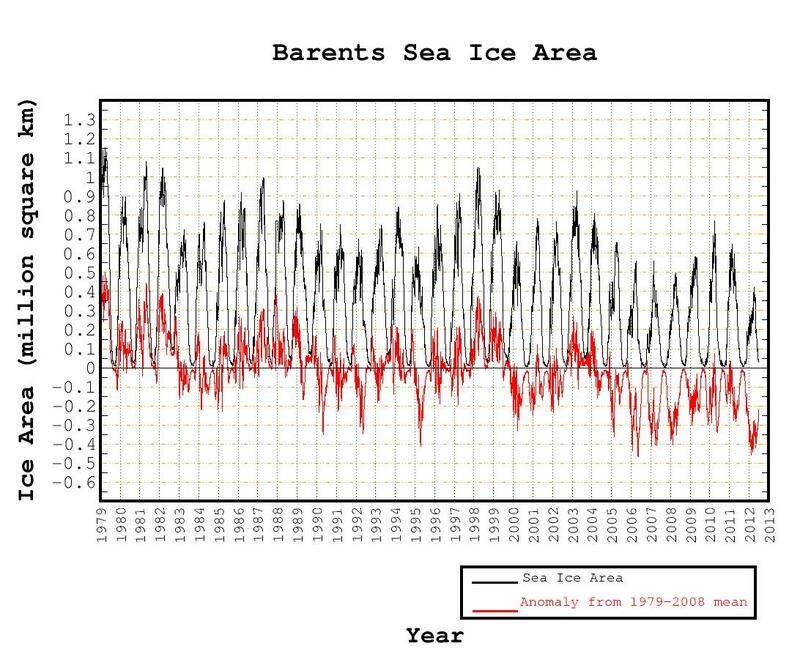 We are seeing satellite era record melt and record ice formation (in the cold season), because of the difference in decline of the minimum and maximum extents. 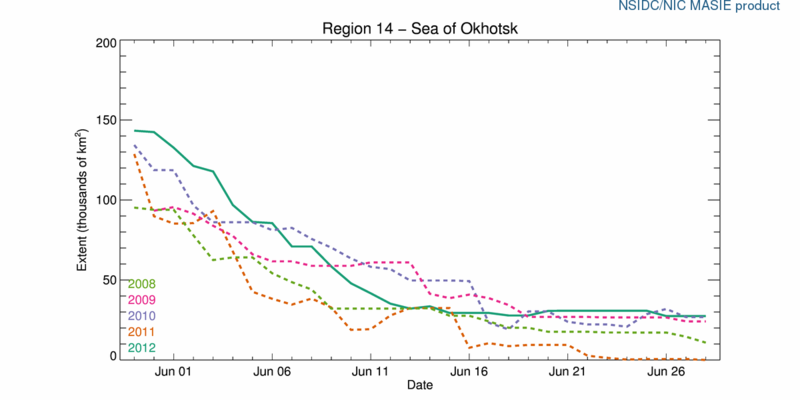 That must mean record heat loss from the Arctic ocean. Although the albedo change from ice to water, I discussed earlier, will mean a large increase in ocean heat from insolation. 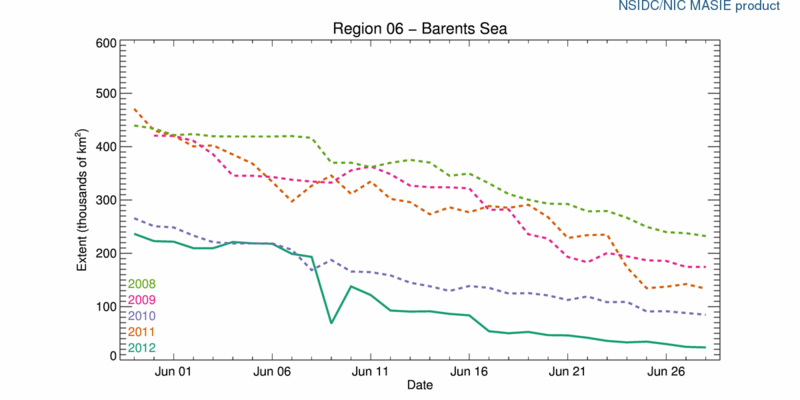 Overall I think there is a net heat gain in the Arctic Ocean. Ice melts in two ways. Increasing volcanic activity which releases water at close to 800 degrees, and the decreasing magnetic field of the planet which creates the ion fields which in turn now creates less for the ozone layer.The thining layer allows more high uv radiation to reach the surface and melt the ice. So it comes from above and below, even though It only converts to heat when it reaches the surface. So most melting is from the volcanic activity. Perhaps 90% of volcanic activity is beneath the oceans. 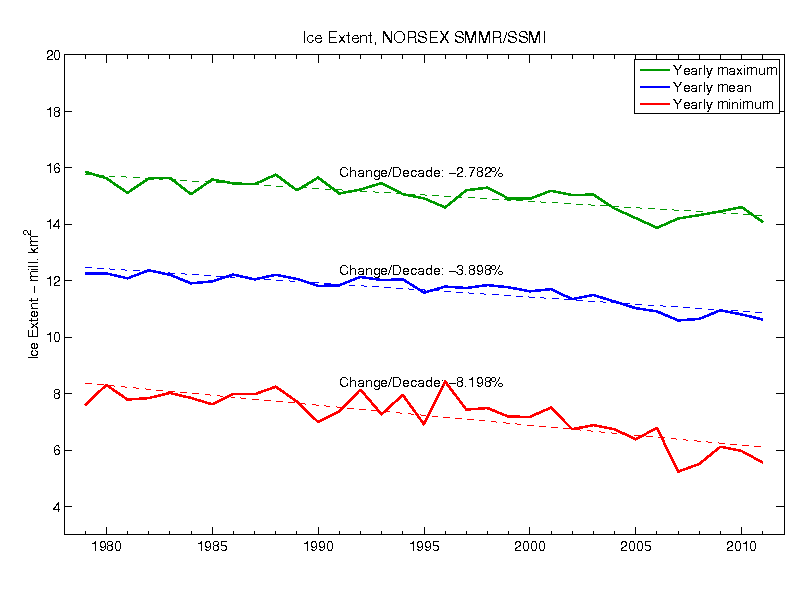 So, while overall I would say we’re approaching an ice age now, we also see increased melting in the arctic. The impacts of compression are apparent between 0 and 180 W longitude. Go to my blog site Steve, and listen to the video in the section. Original Geoengineering of Creation / Pole Shift. https://authorthat.wordpress.com/2011/09/14/original-geoengineering-of-creation/comment-page-1/#comment-144 See Approaching Brown Dwarf. Can you provide any evidence to support your assertion? The use of HAARP can steer natural earth forces as a dual edged sword, for the dialectic of control which evil desires, like the computer simulated Katrina or Hati use. Volcanic activity has increased, melting the ice in the polar regions.